During the Second World War, Italian tank units matched brave crews with decrepit vehicles. Thanks to the monopolies held by the fascist state's favorite corporations, badly outdated tanks caused the deaths of hundreds of tank crewmen trying to combat much more capable Allied tanks with their Italian "iron coffins." 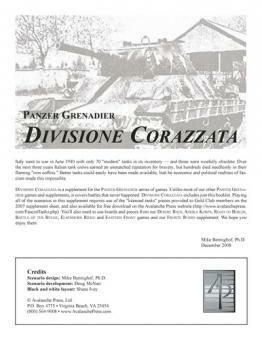 Better machines could have been made available: the P26/40 "heavy" tank (actually a medium-sized vehicle) that failed to enter production in time for the campaign in North Africa, or the German licenses that Italy never sought. Divisione Corazzata is a supplement based on Italy's planned but un-built vehicles, drawing on pieces already provided in our Desert Rats game and Gold Club supplementary counter sheet, but until now never used in scenarios. There are ten scenarios, or separate game situations, exploring the potential use of these vehicles. This module is not playable by itself, but requires ownership of our Eastern Front, Battle of the Bulge, Afrika Korps and Desert Rats games. It also requires the 2007 Gold Club Coutnersheet or the downloaded counters from Avalanche Press.